Mergulhe na música e na paixão do flamenco neste passeio a pé de 3 horas em Sevilha - o berço da forma de arte. Passeie pelas ruas da cidade enquanto aprende sobre a história do flamenco a partir do seu guia local. 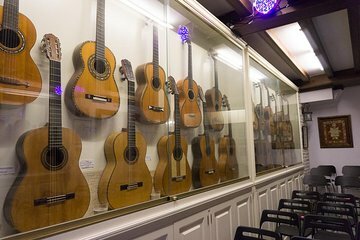 Visite o Museu do Violão, onde você saboreará uma taça de vinho andaluz enquanto descobre como a música, a música e a dança se combinam para criar a magia do flamenco. Finalmente, experimente o flamenco para si mesmo com um show ao vivo em um autêntico "tablao"! Well worth it, there were only two of us in the group so it was a personal guided tour. The guide, Daniel, was excellent and knowledgeable. Daniel the tour guide was very knowledgeable about the history of the area and when explain different topics' It was presented in a way , you could ask questions and it was very one on one. The flamenco show was fantastic. The performance and location was perfect. I would highly recommend. Penelope, was great,each tour guide we had over lapped each other a little, but added some more each time we went on a tour, we saw true Flamenco, not for everybody, but a great experience , if you can , do it, enjoy. This tour started with a brief walk from the meeting point, where the tour guide took advantage of the opportunity to show and tell us some lesser known history and sightseeing . We enjoyed a pre-dinner drink, Seville style. Our tour gave us front seats at the Flamenco show, which was fantastic. Really informative tour ending with a great flamenco show. Well worth the cost and a definite 'to do' in this beautiful city. Nice historic context with Seville as the theatre backdrop. Moving and emotional performance with front row seats. Not a tourist trap. Daniel, our guide spent at least 2 hours walking around Séville with us. He was funny and interesting and personable. We learnt so much about daily life of Sevillians. Then on to front row reserved seats at a wonderful flamenco show. We had previously been to a tourist trap type flamenco show in Salamanca and could not get over the quality of the show in Seville. Great experience. Viator has yet to disappoint us. We were privileged to be the only 2 people on this tour, expertly led by Pilar. She was fun, enthusiastic and so knowledgeable. We learnt so much about the history of Seville, not just flamenco. She also pointed us in the right direction for food and drink I'm now a convert to the wonderful 'vino de naranja'. The flamenco show was in the most lovely of places, an intimate venue with some excellent artists, we were completely bowled over by the quality of the performance. I'm so pleased I chose this tour! Pilar was amazing. Her knowledge of flamenco is outstanding. Learned quite a lot and throughly enjoyed myself. The flamenco venue was cozy and inviting with a great collection of guitars. The performers were amazing and I felt like this was how flamenco was meant to be experienced.